KEY FEATURES: Erect rigid annual herb. Soft oppoiste leaves, arrowhead-like, to 15x9cm. Terminal clusters of flowers with small yellow petals and five radiating and sticky arms at base. Native of Asia; an accidental Polynesian Introduciton or very early Recent Introduction. Formerly used to scent oil, and in medicine. A wayside weed in the volcanic lowlands. POSITIVE SIGNIFICANCE: Medicine, Adornment, oil scent. Comments: Little known nowadays. 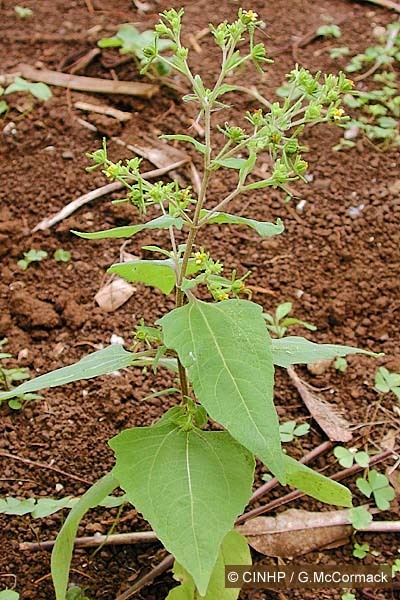 Formerly used to scent oil, the mildly fragmetn leaves in ‘ei, and sometimes in medicines. 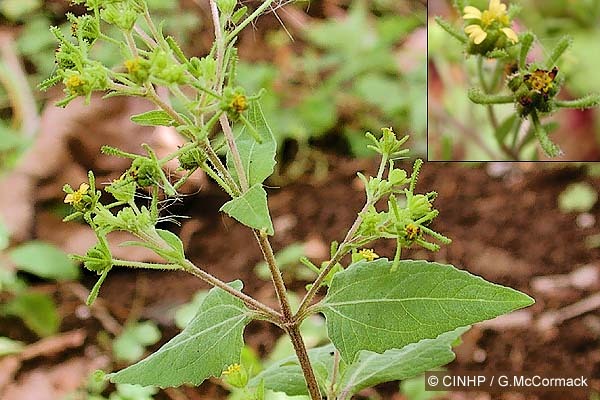 IDENTIFICATION: Erect annual herb to 80cm. STEM rigid, ridged, hollow; opposite ascending branches. LEAVES opposite, arrow-shaped, narrow to wide (to 15x9cm), a few slight teeth, dull-furry; stalk 2.5cm winged. FLOWERS in branching terminal clusters; each with 5 basal radiating arms, sticky, to 1cm (=the involucre), petals small to 2mm yellow, notched. SEED ovoid to 3mm, without fluff (pappus). GENERAL NOTE: Formerly flowers and leaves used to scent oil (Christian 1924:13). Occas. used in ei and medicine (AW90). Now uncommon, although it was common all districts in teh 1920s [Wilder]. Rarotonga: fieldspecimen+photo, Ara Metua, Matavera, 8/2001, ID GM.